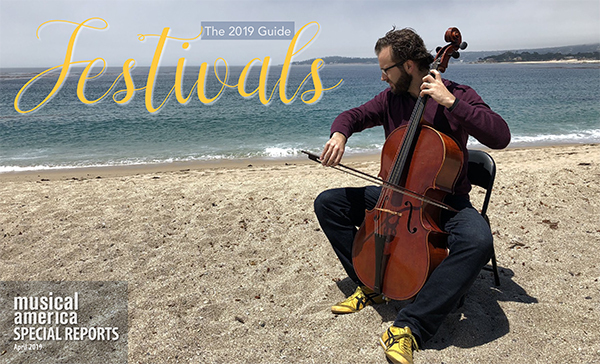 The newest Guide to Festivals covers nearly 100 festivals with everything from opera in the Swiss Alps and chamber music in a California vineyard to prepared piano at a Massachusetts modern art museum. 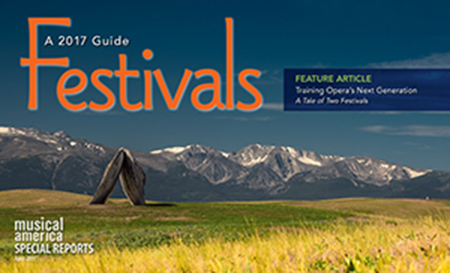 Such is a sampling in our sixth annual Guide to Summer Festivals. 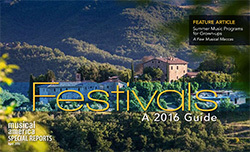 Additional highlights: the world premiere of Poul Ruders’s The Thirteenth Child at Santa Fe Opera; pianist Yuja Wang (Musical America’s 2017 Artist of the Year) performing in Croatia at the Dubrovnik Summer Festival; and Fabio Luisi conducting Beethoven’s Sixth Symphony in Tuscany, at the Chigiana International Festival. There is a rich and entertaining world of live music ahead of us. This is our fifth annual Guide and it offers annotated listings of all shapes and sizes of competitions. They range from piano to voice to woodwind to all of the above; from annual to biannual to quadrennial; some include master classes; some are open to the public and include live rounds, others are by recorded submission only. But be they evolving or staying the same, competitions of any stripe remain an exciting way to discover, develop, and honor our rising artists. We also sat with Pierre van der Westhuizen, currently in his second year as director of the Irving S. Gilmore Keyboard Festival and Awards. Westhuizen knows his way around competitions, having been the previous CEO of the Cleveland International Piano Competition, which he transformed into a world-class, multi-faceted experience. Who makes it all work? These are the heroes, sung and (heretofore) unsung, of the performing arts industry. What is striking about these individuals is their passion, creativity and dedication to making the arts thrive. These are the folks who make the industry tick, brainstorm the new ideas, get the artists on stage, help build the audiences and train the artists of tomorrow. The 2019 Guide contains nearly 200 national and international listings. Some combine learning from the pros by day with listening to them perform by night. Others put the talent-in-training on stage and charge admission. The programs come in all shapes and sizes. Some take place over a weekend, others last all summer. At the Salzburg Summer Music Academy, 1,000 students work with a faculty of 70; at the Bang on a Can Summer Festival, the count is 40 teachers to 11 students; at NYO Jazz, it’s 22 to 10; at Tanglewood it’s 155 to 75. Some are free, some are decidedly not. Virtually all of the pre-professional institutes require an audition of some kind, while those for the very young steer clear of a competitive atmosphere. 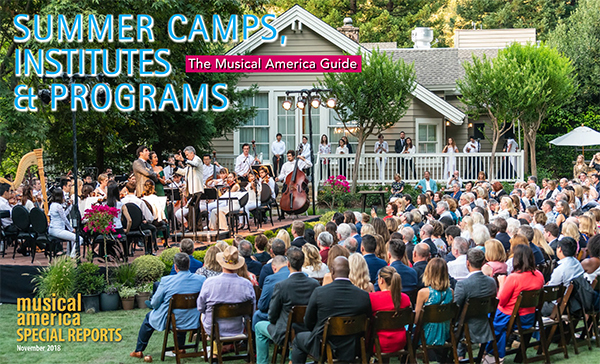 The listings in the Guide provide many options for musical self-improvement, with the added summertime bonuses of fun, friendship, and warm weather. 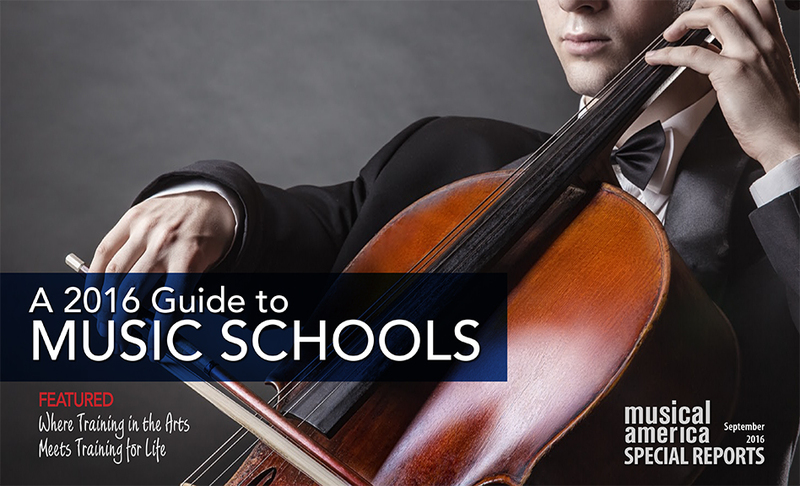 The new Guide contains key information — scholarships, faculty, audition requirements, just to name a few — on 50-plus top music schools, all in an easy-to-use format. 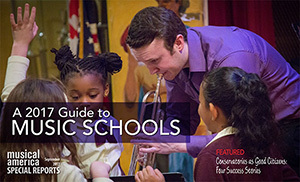 Two trends emerge in the Guide: Schools are now offering more and deeper areas of concentration, such as in Performing Arts Health, Lied Interpretation for Pianists, or a masters degree in Contemporary Chamber Music; and schools are injecting real-world relevance in the performing arts. Examples: Office of Entrepreneurship and Career Development at the Jacobs School of Music at Indiana University and the entrepreneurship grants and start-up funding for musical projects provided by the Curtis Institute. What do the two trends mean? Schools are fully cognizant of the need to equip students to put their years of training to work as well as to develop expertise in the performing arts. Sounds like a winning combination. 25 Stars Still Rising: Where are they Now? Nearly 10 years ago, Musical America launched a feature called New Artist of the Month. The criterion for being chosen was (and still is) that the performer/composer/conductor either be a relative newcomer or someone long toiling in the field without the recognition he or she deserved. The only other criterion was that he or she had been witnessed in action by one of our contributors, who felt this was a talent worth watching. Now, nearly 115 months later, we’ve accumulated a list of more than 100 not-so-new-but-still-rising artists. Following is an update of 25 of our proudest picks, arranged oldest to newest. 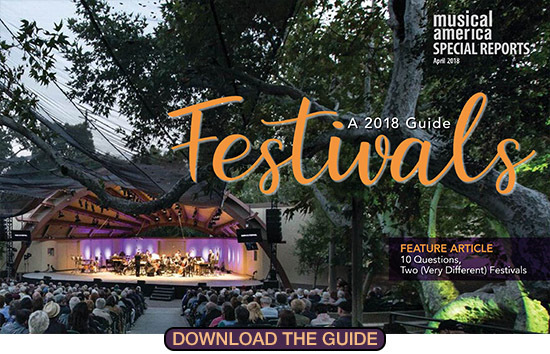 Musical America contributor George Loomis also interviewed officials at two highly regarded events—Ravenna and Ojai—and asked them one set of questions, just for the purposes of compare and contrast. The two couldn’t be more different: one takes place over a weekend, the over a two-month period; one is in the U.S., the other in Europe; one is rural, the other urban; one’s in a valley, the other by the sea; one focuses on contemporary fare, the other on traditional; one houses its artists in homes, the other in hotels; Ojai’s venues are primarily outdoor and strictly 20th century, Ravenna’s are mostly indoor and date as far back as the sixth century. It’s a fascinating study of contrasts. 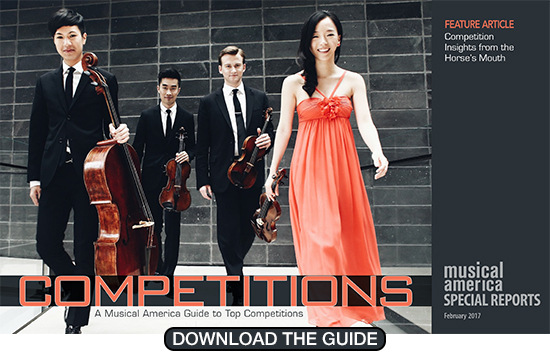 This Guide is our biggest to date and we've added more information about the competitions―everything from their Twitter handles to the names of the jury members, entry fees, cash prizes (as well as management, performances, and recordings), deadlines, frequency, disciplines, eligibility, and the dates of the semi-finals and finals. So, whatever the discipline, you (or your students) are bound to find the right competition at the right time and the right place. We also interviewed Benjamin Woodroffe, secretary general of the World Federation of International Music Competitions (WFIMC), for his insights into the latest trends in competitions. Woodroffe discusses how the larger competitions are not only choosing the best and the brightest contestants, but also booking them, training them, and managing them. 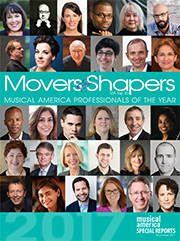 The Musical America Worldwide audience voted for the movers & shapers and here they are: 30 Professionals of the Year who are shaping the performing arts landscape for the future. From Carnegie Hall to the Crazy Horse Memorial in South Dakota, from Omaha Performing Arts to the Really Spicy Opera of the Twin Cities, these are the people redefining and driving the performing arts towards a future shaped by their vision. 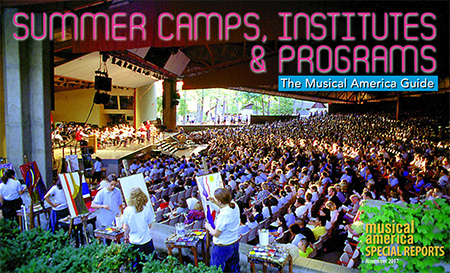 The inaugural Guide to Summer Camps, Institutes & Programs includes key information about more than 170 programs and is designed for ages seven to 70—teachers and parents looking for a summer arts program for their charges, high school students en route to the conservatory and those on their way to a professional career. The Guide is also directed to those for whom the arts is an avocation, looking to hone or rekindle their chops over a summer vacation. We’ve included both foreign and domestic programs, the tiny programs (Cellos at Belle Serre in Castres, France, with an enrollment of ten) and the huge programs (University of North Carolina at Greensboro Summer Music Camp, with 1,900). The 2017 Guide is our fourth annual Festivals guide and the largest to date. We provide in-depth information about these summer musical oases: locations, ticket prices, dates, disciplines, artistic directors, and—for our managers and artists—booking cycles and contacts. Special Feature: In a special feature article, we examine two summertime young-artist programs, one domestic and one foreign: Glimmerglass and the Aix-en-Provence Festival’s Académie. They share only two characteristics: their focus on opera and their sterling reputations. Otherwise they are very different. Glimmerglass is far smaller and also younger, but they have the same goal: training the artists of tomorrow by enabling them to work under and play—in every sense—with the pros of today. Competitions may be controversial, grueling and, in the end, heart-breaking, but there’s no denying that winning one can launch a major career. Culled from the hundreds of competitions in our database, we’ve come up with a select list; in it you'll find information on frequency, deadlines, disciplines, semifinal and finals dates, eligibility, awards options (such as performances, management, and recordings), and much more. Special Feature: In a special feature article, we asked five top competitors about what they’ve learned, both as winners and losers, through their experiences. "I always imagine myself being as nervous as possible and still playing well," said Austin Larson, winner of the International Horn Competition of America—just one nugget among many uncovered in our interviews. 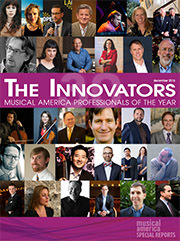 The Musical America Worldwide audience voted for the innovators and here they are: women composers who mentor teenage girls to follow in their footsteps; opera company GM’s who are pushing the envelope and bringing in new audiences; a cellist who plays in neo-natal units; a conductor who leads choirs of homeless men and women; a pianist bringing back the pedal piano by commissioning new works for it; a competition in which everybody wins; a publicist who creates a press kit with origami cranes to promote a show called Wings. Their ideas and the courage to follow them through, no matter how off-the-wall, controversial, or otherwise out of the box, keep us moving forward, spur us on to stay creative and keep the field of performing arts vital and exciting. Your audiences are mobile and are using their devices before, during(!) and after performances, according to research in this Special Report. Is your mobile marketing, ticketing and programming meeting your customers' needs? 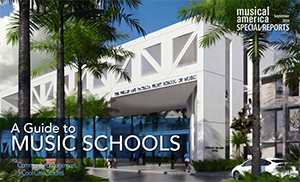 We've chosen to highlight 45 music schools from our database of 1,210 music schools. We asked each of our picks for additional details, such as: audition requirements, post-graduate assistance programs, number of full time and adjunct faculty and number of scholarships awarded. Special Feature: Musical America explores career-guidance oﬀerings at schools, both before and after graduation. 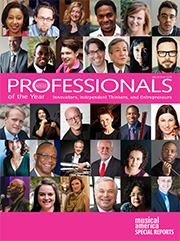 In our feature story, Where Training in the Arts Meets Training for Life, author Ian VanderMeulen speaks with oﬃcials at ﬁve schools that we felt were particularly well-attuned to job market opportunities and challenges: Curtis Institute, London's Guildhall School, Indiana University's Jacobs School of Music, Juilliard and San Francisco Conservatory. As the digital entertainment options continue to explode, arts organizations are devising ever-more ingenious solutions for growing audiences and staying relevant. Here are how seven arts organizations are using new thinking, new programs and new media. In this year's Guide, you’ll notice newcomers, such as Tippett Rise, established 2016 in Fishtail, Montana, and old faithfuls, like the Salzburg Festival, founded in that historic city in 1920 and not standing still: Cecilia Bartoli will be singing Maria in West Side Story. Not to be missed. Special Feature: Our feature story reviews summer music programs that enable "grown-up" individuals to practice a favorite avocation, make friends, and, in many cases, enjoy the scenery. At the Tuscany Project, you can join a gospel choir while spending a week on the Greek Island of Kefalonia, among other of the Project’s locations; or pull your ?ute out of moth balls and head to Baltimore for the BSO Academy. Enjoy. We've combed through our database of 500-plus listings of national and international competitions to come up with a special list, chosen either by virtue of their prize monies, their prestige, their unusual nature, or a some combination of these attributes. You'll find information on frequency, deadlines, disciplines, semifinals and finals dates, eligibility, awards options (such as performances, management and recordings), and much more. Special Feature: We sat with mezzo-soprano Jamie Barton, recent Richard Tucker Award winner and someone on an astonishingly swift career trajectory, to try to find out her approach. Pretend it's just another job, she says, because "doing your job doesn't make your mouth go dry and your legs shake." You answered, with hundreds of nominees. Please join us in celebrating the Musical America 30: The Influencers. The move toward delivery and use of digital music scores (and music notation software) has gained enormous speed since our first Special Report on the subject last year. Discover what major organizations and innovators are doing. 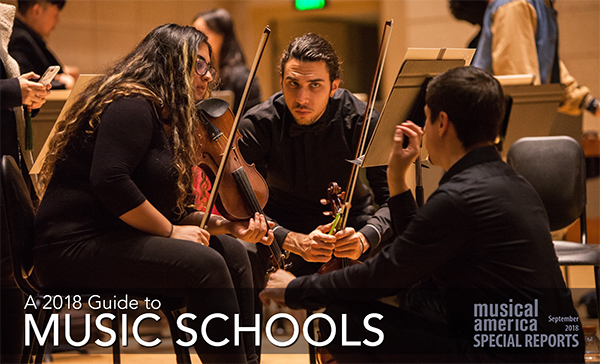 Welcome to Musical America's 2015 Guide to Music Schools. The editors have selected top schools from the 1,223 educational institutions in our database and contacted each to gather key information, such as admissions and audition requirements, financial and tuition information, post-graduate assistance programs, and number of full time and adjunct faculty. The promise has been there for a while: streaming your live performances to a vastly expanded worldwide audience. But only recently have all the elements come together, such as Internet speed, ecommerce tools, reduced video creation costs and audience comfort with the digital streaming medium. 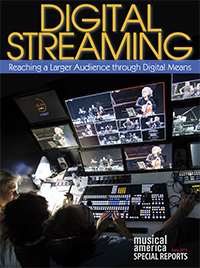 Is it time to take a serious leap into live digital streaming? 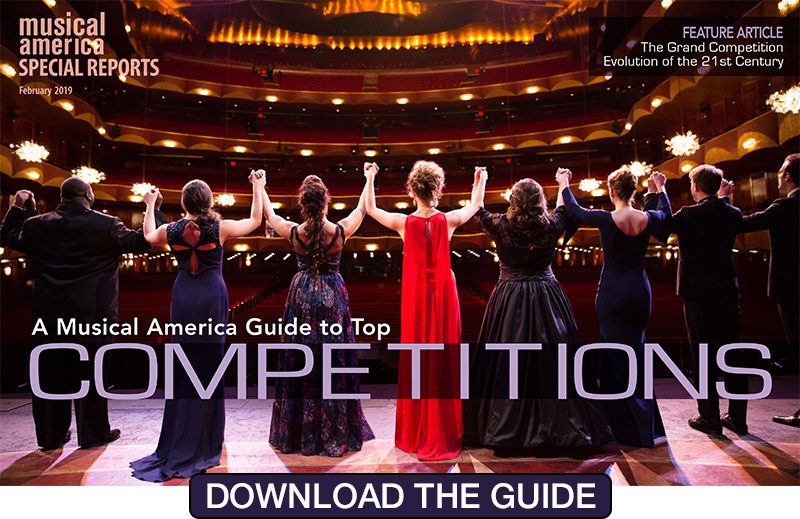 Musical America asked the bellwethers how they did it and interviewed experts to discover the best ways to get started (and where the pitfalls are). With our annual Special Report on Festivals, we continue a Musical America tradition dating back at least 50 years—perhaps longer—of reporting on the year’s upcoming festivals. It would be interesting to compare our reporting from those days with this report; many of the mature destinations—Tanglewood, Aspen, Marlboro—are still very much alive and kicking, changing with the tides but true to their core missions. • And our personal favorite, Buddhist monks in Norbulingka, Tibet (Shoton Festival). 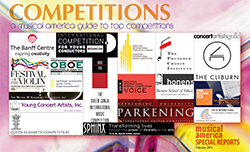 The top competitions worldwide and key information for each: eligibility, deadlines, prizes, categories, locations, juries and more. Also, we asked author, pianist, and well-travelled jury member Stuart Isacoff to write about his own experiences behind the closed doors of jury deliberations and to discuss some of the different ways competitions are judged. We recently asked the worldwide performing arts community to nominate 30 people who have "taken a risk, spoken out where others were silent—all to the measurable benefit of their arts organizations and the field." America editors, it was a labor of love. We combed through the nominees (not an easy task; all were deserving) and based our 30 final choices on those who can show measureable results, uniqueness, persistence in the face of resistance or hardend tradition, and inventiveness. These are the risk-takers and innovators. Please join us in celebrating the Musical America 30: Profiles In Courage. It's about data, timing and (of course) social media. Many arts organizations have realized if they want younger and/or more clientele, they’ll have to go out into their communities and get them. 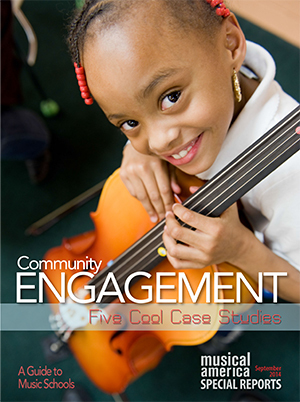 In Cool Case Studies, we focus on five organizations doing just that, in ways we think are particularly inventive. 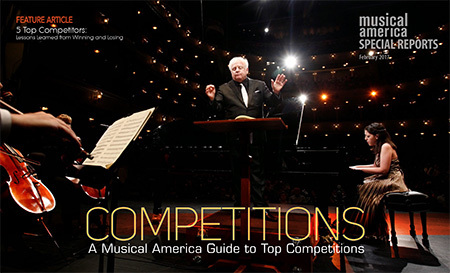 For those still unsure of where they’ll land in September 2015, Musical America's editors have compiled a guide of 51 top music schools and conservatories around the world, selected from the 1,278 listed in the Musical America Directory. Musical America’s latest Special Report, Music Publishing: Copyright Demystified, untangles the many components of the “bundle of rights” protecting and fostering the very core of the arts world: The Work. After all, the proper use of artistic works is one of the bedrocks of the business as well as for fostering creativity. It also keeps everyone on the right side of the law. 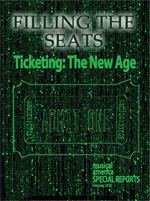 • Untangling the Bundle: Synchronization Rights, Mechanical Rights (and quite a few more) • From the Musical America archives, July 1924: What will the Music of 2024 A.D. Be Like? For some exceptional performers and business notables, success has followed a path filled with wrong turns, lucky breaks, crises of the psyche—or all of the above. Here are the stories of five of those extraordinary careers. After intense reflection and (mostly civilized) debate, Musical America is proud to present the Movers & Shakers of the Performing Arts Industry.Directors, presenters, marketers, executives, administrators--these are the luminaries, both in front and behind the scenes, who relentlessly strive to innovate and expand the performing arts while keeping their organizations healthy. The recording landscape has been transformed by technology's relentless march forward. Still, achieving success in whatever side of the business you are on—producing, selling, distributing, even buying recordings—means navigating the recording labyrinth. Social marketing is now a critical business tool—and requires a businesslike approach. What is your strategy and ROI? Are your efforts organized for greatest impact? What can you learn from other successful operators? The stunning growth of mobile—and the way audiences have embraced it—point to one thing: mobile is vibrant and lucrative and will reward performing arts organizations that target audiences through innovative, relevant marketing. Fundraising is a performing art requiring creativity, skill, and discipline. In this Special Report, we look at successful efforts, some of the pitfalls, and how to leverage social media for ongoing fundraising success. • What’s the difference between a nonprofit and a 501(c)(3)? It used to be simple: sell the ticket, fill the house, earn the income, end of story. Not anymore. The sale is now the start of a far more personalized relationship with your customer. We explore the needed technology, skills and methods. 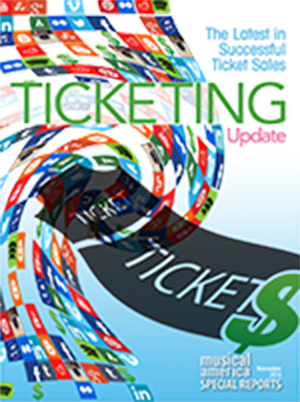 • Ticketing is Getting Personal • Where Should Ticketing Live in My Organization? We took a look back at 2012 and a peek ahead at 2013. Read about the most important news stories in 2012, the year's movers and shakers, some of the best decisions made, and predictions for 2022 from some of the industry's leaders. We combed the business to look for the up-and-comers, the ones with the fresh take, people who are injecting new ideas into the performing arts industry: Artist Managers, Orchestra Leaders, Presenters, Communications & Public Affairs Pros, Educators, and Radio & Recording Pros. These professionals bring something truly special to booking, presenting, promoting, educating and raising money. 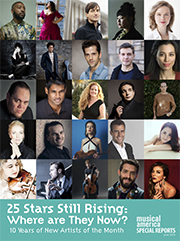 Musical America's Rising Stars—the ones to watch. 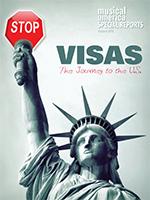 Visas: The Journey to the U.S. Obtaining visas for non-U.S. artists to visit the United States can be daunting and frustrating. Musical America talked with managers, presenters, lawyers and the U.S. government to find out how to speed this sometimes overwhelming process. 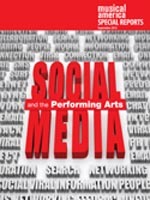 Experts and marketers in and out of the performing arts reveal how to tap the power of social media for effective arts marketing, boosting your ticket sales and exciting your audiences. Musicians are "the elite athletes of the small muscles"—with the need to stay on top of their abilities during a long career. 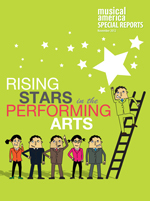 We looked into the unique health care needs and solutions faced by musicians and businesspeople in the performing arts. Read the articles below or download the special report PDF. Key players across competitions provide straight answers to critical questions. Judges: what do they really look for? Presenters: does winning ensure bookings? Managers: do competitions matter? Winners: does winning make a difference? • Managers: Do Competitions Matter? (or not) • 5 Minutes with 4 Presenters: Win a Contest, Get a Gig? Packed with actionable information and best practices—case histories, in-depth interviews, tips, best practices and deep-dive reviews of successful digital marketing campaigns in the performing arts.